Mars and Jupiter are meeting up in the morning sky. Soon they’ll be joined by the Moon. 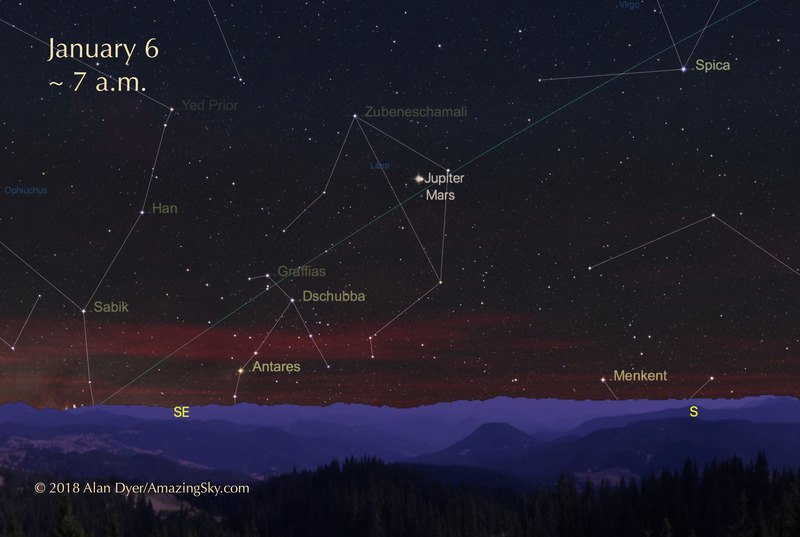 Here’s a heads up for one of the best planet conjunctions of the year. Mars and Jupiter are now close together in the dawn sky to the south, and getting closer! 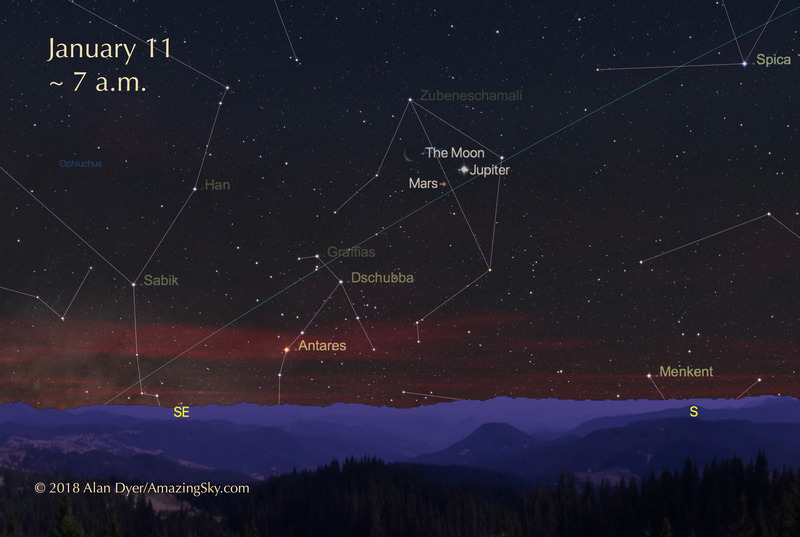 Above is the actual view on the morning of January 4, with Jupiter the brightest of a trio of objects. Mars is reddish and in the middle. The object at right is the star Alpha Librae, also known as Zubenelgenubi in Libra. As shown in the simulation above, on the morning of January 6 Mars and Jupiter will be only 1/3rd of a degree apart (20 arc minutes), so close that dimmer Mars might not be obvious to the naked eye next to bright Jupiter. But use binoculars to show the planet pair. The next morning, on January 7, they will appear almost as close, as Jupiter climbs higher past Mars. As shown here, on the morning of January 11 the waning crescent Moon will sit only 4 degrees from the planet pair, with all three worlds gathered close enough for binoculars to frame the scene. With sunrise coming late on winter mornings, it doesn’t take an early rise to take in the dawn scene. Make a note to take a look about 6:30 to 7:00 a.m. over the next week. Here’s the real scene from the morning of January 6, with Mars and Jupiter just 16 arc minutes apart, very close but still easy to distinguish with the naked eye. Jupiter did not overwhelm Mars. Saturn, Mars and the Milky Way appeared in the twilight over the Bow River. I shot this scene on August 24 from the viewpoint at Blackfoot Crossing Historical Park, overlooking the Bow River. 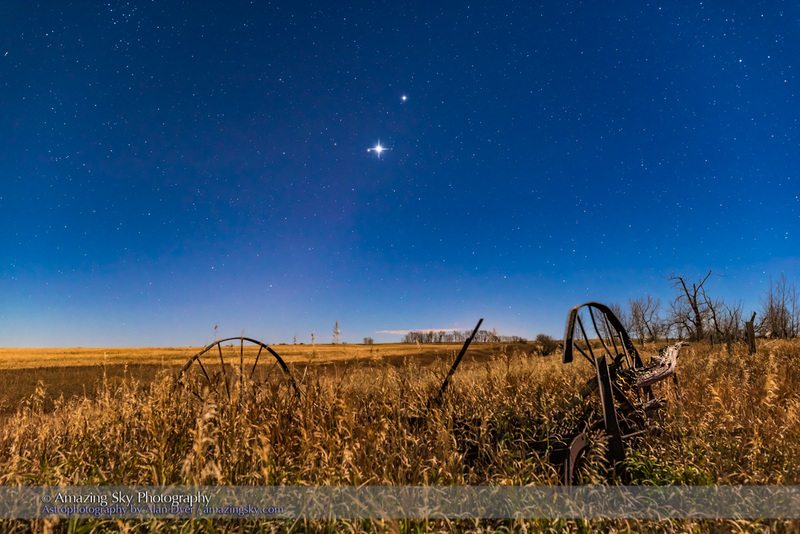 Mars appears between Saturn above and Antares below, in a line of objects west of the Milky Way. The valley below is the traditional meeting place of the Blackfoot Nation, and the site of the signing of Treaty Seven between Chief Crowfoot and Colonel MacLeod of the North West Mounted Police in 1877. 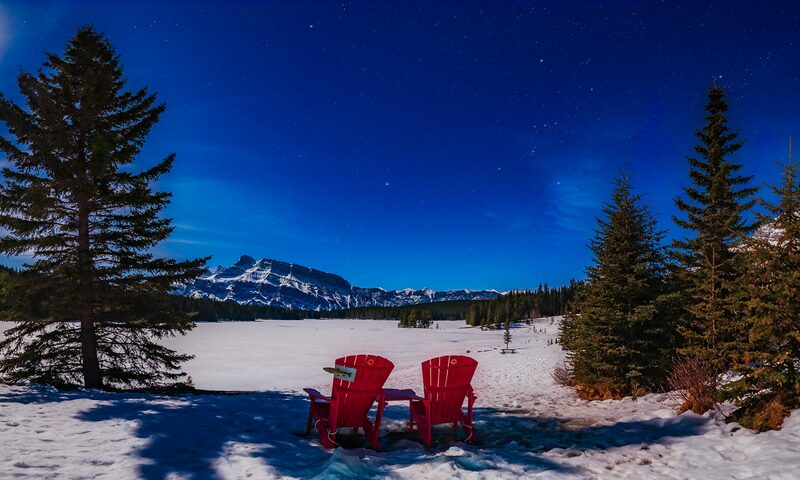 The image is a panorama of two images, each 20-second exposures at f/2 and ISO 1600 with the 24mm lens. I shot them just prior to shooting time-lapses of the moving sky, using two cameras to create a comparison pair of videos, to illustrate the choices in setting the cadence when shooting time-lapses. The movies, embedded here, will be in the next edition of my Nightscapes and Time-Lapse ebook, with the current version linked to below. The text explains what the videos are showing. Shoot fewer but longer exposures at slower ISOs and/or smaller apertures. Shoot lots of short exposures at high ISOs and/or wide apertures. The former yields greater depth of field; the latter produces more noise. But with time-lapses, the variations also affect the mood of a movie in playback. Clip #1 was taken over 2 hours using 20-second exposures, all at ISO 2000 and f/2 with 1-second intervals. The result was 300 frames. Clip #2 was taken over 1 hour using 5-second exposures also at f/2 and 1-second intervals, but at ISO 8000. The result was 600 frames: twice as many frames in half the time. Clip #1 shows fast sky motion. Clip #2 shows slow motion. Clip #2 exhibits enough noise that I couldn’t bring out the dark foreground as well as in Clip #1. Clip 2 exhibits a slower, more graceful motion. And it better “time-resolves” fast-moving content such as cars and aircraft. The movie taken at a longer, slower cadence (using longer exposures) and requiring 2 hours to capture 300 frames resulted in fast, dramatic sky motion when played back. Two hours of sky motion are being compressed into 10 seconds of playback at 30 frames per second. You might like that if you want a dramatic, high-energy feel. By comparison, the movie that packed 600 frames into just an hour of shooting (by using short exposures taken at fast apertures or fast ISOs) produced a movie where the sky moves very slowly during its 10 seconds of playback, also at 30 frames per second. You might like that if you want a slow, peaceful mood to your movies. So, if you want your movie to have a slow, quiet feel, shoot lots of short exposures. But, if you want your movie to have a fast, high-energy feel, shoot long exposures. As an aside – all purchasers of the current edition of my ebook will get the updated version free of charge via the iBooks Store once it is published later this year. Mars outshines his rival red star Antares in the heart of the Scorpion. This was the view last night from my observing site in Australia, of red Mars shining near the red star Antares, whose very name means “rival of Mars.” But as Mars nears its closest approach to Earth next month it is already far brighter than Antares, easily winning the rivalry now. The view takes in the head of Scorpius, one of the most colourful areas of the night sky when photographed in long exposures. Uniquely, Antares illuminates a nearby dust cloud with its light which is more yellow than red. Other dust clouds reflect the blue light of hot young stars in this section of the Milky Way. Red nebulas are emitting their own light from glowing hydrogen. The area around Antares is also streaked with lanes of dark dust that absorb light and at best appear a dull brown. Mars reaches its closest point to Earth since 2005 on May 30. All through May and June Mars will shine as a brilliant red star near Antares. A telescope will provide the best view of the red planet we’ve had in a decade. This is a stack of 4 x 3 minute exposures with the 135mm telephoto lens at f/2.8 and filter-modified Canon 5D MkII at ISO 1600, shot April 14, 2016 from Tibuc Cottage, Australia. While you are in the area aim your telescope a little to the east to catch Saturn, also in the area, though technically over the border in the constellation of Ophiuchus the Serpent Bearer. In the view above, Saturn is the bright “star” to the left of Mars. Saturn reaches its closest to Earth in early June. Its rings are now wide open and a spectacular picture postcard sight in any telescope. This is a stack of 2 x 30-second exposures for the sky and ground, both tracked, plus a 30-second exposure through the Kenko Softon A filter to add the star glows to make the constellation pattern stand out. All with the 35mm lens at f/2 and Canon 6D at ISO 1600. Taken from Tibuc Cottage, Australia. This final view shows Mars and Saturn rising with Scorpius in the moonlight from two nights ago. From my current latitude of 32° south, Scorpius comes up on his side. The morning planets are now strung out along the ecliptic, visualizing this line in the sky. 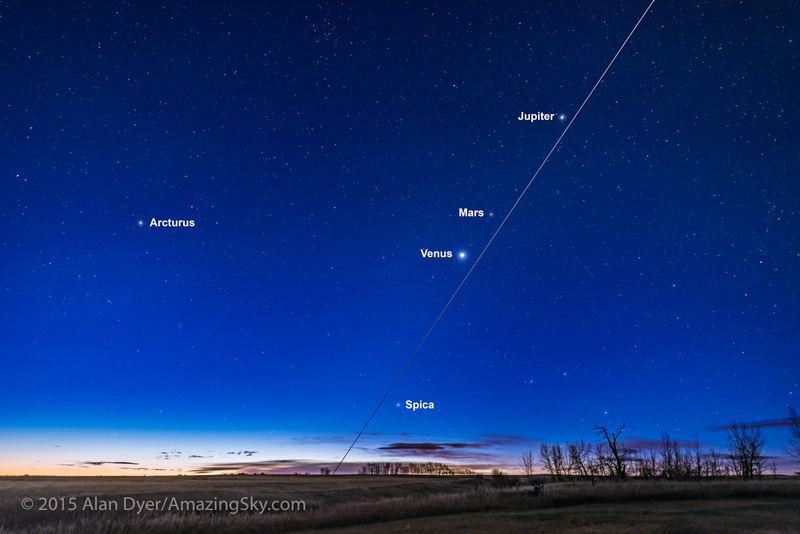 This was the view this morning, November 14, of the three dawn planets lined up along the ecliptic, with the stars Spica and Regulus also defining this imaginary line. The ecliptic is the Earth’s orbital path around the Sun projected into the sky. So it is along this line that we see the Sun appear to move around the sky over a year. But it is also the path along which we find the seven other major planets – in this case, three of them: Venus, Mars and Jupiter. These three worlds were clustered together in October, but are now spreading out along the ecliptic, as Venus drops lower but Mars and Jupiter climb higher. The stars Spica and Regulus also lie along the ecliptic, where the Moon can occasionally pass in front of, or occult, these stars. So the two stars and three planets are now nicely drawing the ecliptic line for us in the dawn sky. At this time of year, the ecliptic is also steeply angled above the eastern horizon. The main image above is a stack of 4 x 20 second exposures for the ground, to smooth noise, and one 20-second exposure for the sky, all with the Nikon D810a at ISO 1000 and Nikkor 14-24mm lens at f/2.8 and at 14mm. This image just above is with the same gear but with the lens at the 24mm setting to more tightly frame the planets. Meanwhile, on the other side of the sky at dawn, Orion and his winter sky friends were setting into the west (image below). 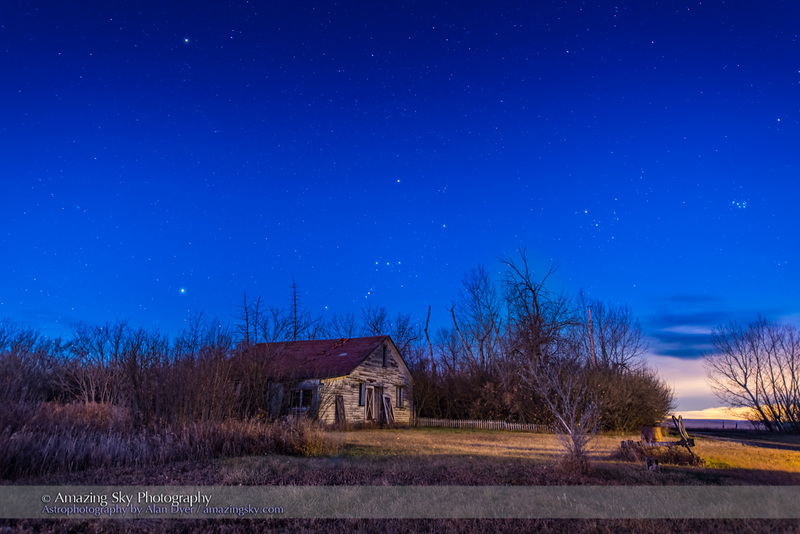 Orion and the winter constellations setting over the old Farmhouse at home, in the dawn twilight on the morning of November 14, 2015. Canis Major and Sirius are at left; Taurus and Aldebaran and the Pleiades are at right. Procyon is at upper left. This is a stack of 4 x 20 second exposoures for the ground to smooth noise and one 20-second exposure for the sky, all with the Nikon D810a at ISO 1600 and 14-24mm Nikkor zoom lens at f/2.8. All the images here are shot with the Nikon D810a camera and the amazing Nikkor 14-24mm lens, two items in hand this month for testing and review. A thorough test will appear in future blogs. Of course, as wonderful as the gear is, it cannot extract the ecliptic line and labels from the sky – those are added in Photoshop! The waning crescent Moon joined the planet trio this morning for a fine sight in the dawn. This was the scene on November 6 with the waning crescent Moon just below Jupiter, and those two worlds just above the pairing of bright Venus with dim red Mars. On Saturday, November 7, the waning Moon will sit beside Venus for an even more striking conjunction. 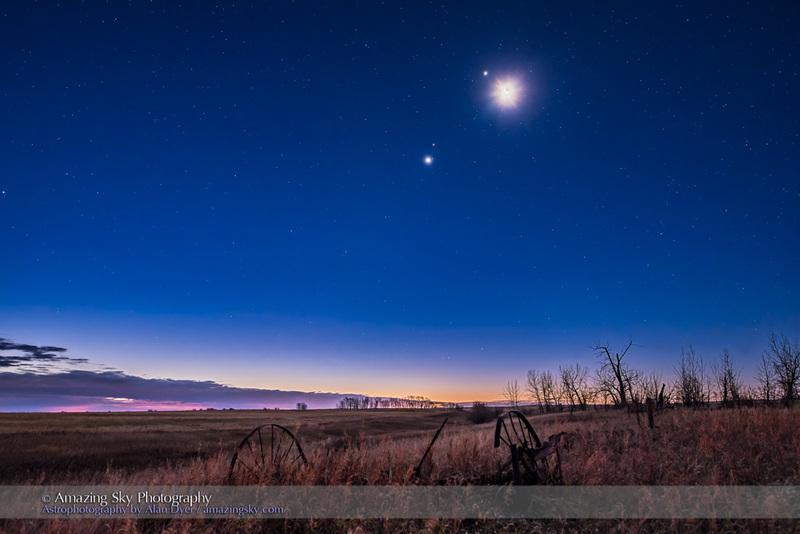 The waning crescent Moon below Jupiter, with that pair of worlds above the pairing of Venus (bright) and red Mars (just above Venus), all in the dawn sky in Leo, November 6, 2015. The stars of Leo are above, including Regulus. This is a composite of 4 exposures: 15 seconds for the ground (to bring out detail there), 4 seconds for the sky (short enough to prevent star trailing), and 1 and 1/4 seconds for the Moon itself to prevent it from being totally blown out as a bright blob. All with the Nikon D750 at ISO 2000 and Sigma 24mm Art lens at f/4.5. Taken from home. This meeting of the Moon with the planet trio more or less concludes the superb series of dawn sky conjunctions we’ve been enjoying over the last month. The planets remain in the morning sky but now go their own ways as Mars and Jupiter climb higher, while Venus drops lower. 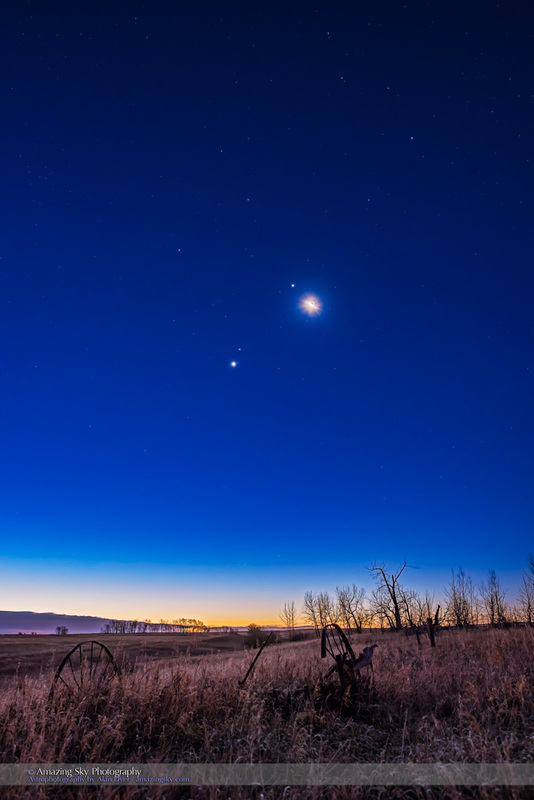 The gathering of planets at dawn is coming to an end as Venus meets Mars. 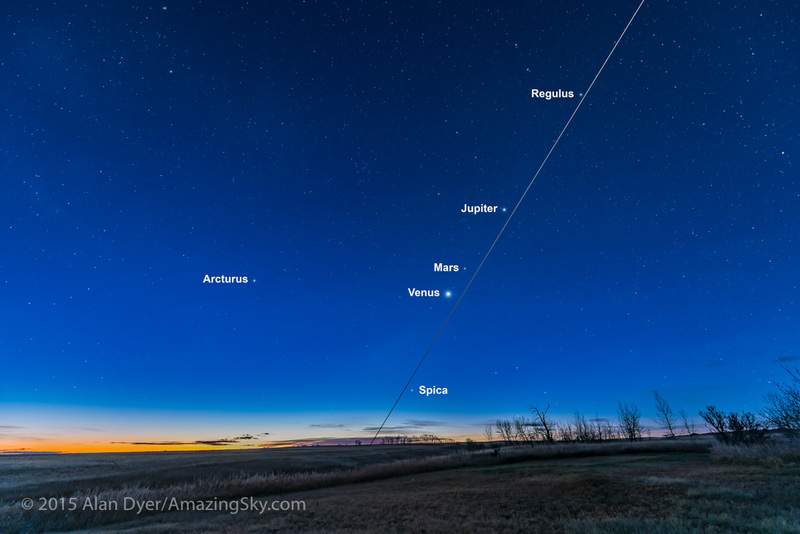 This was the view this morning from home in southern Alberta of the trio of planets in the moonlit morning sky. Venus is the brightest, while dim red Mars shines just to the left of Venus. Jupiter is above the Venus & Mars pairing, with all the planets shining in Leo. Mars and Venus will appear closest to each other on November 2 and 3. Then the group breaks apart as Venus descends but Mars and Jupiter climb higher. 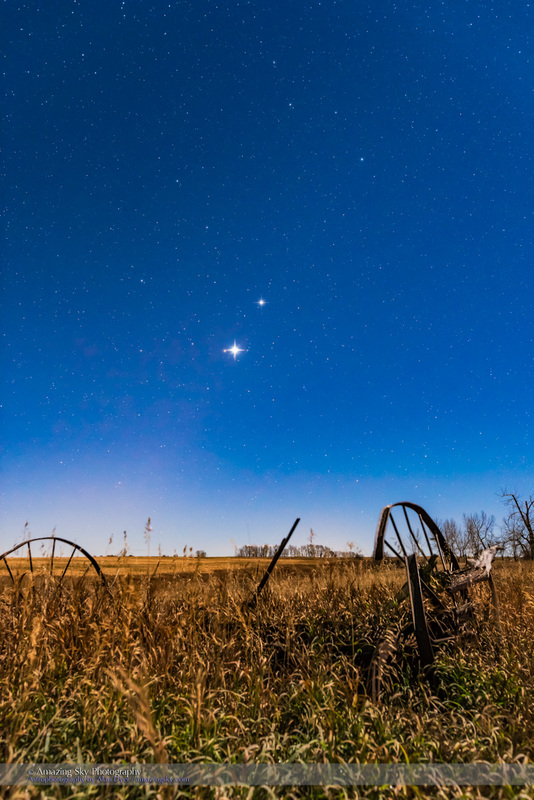 But as they do so they are joined by the waning Moon, by then a thin crescent, on November 6, when the Moon shines near Jupiter, and November 7, when it joins Venus for a stunning dawn sky scene. After that the morning planet dance comes to an end. But in two months, in early January, Venus will meet up with Saturn for a very close conjunction in the winter dawn sky on January 9.